Are you an energy hog? 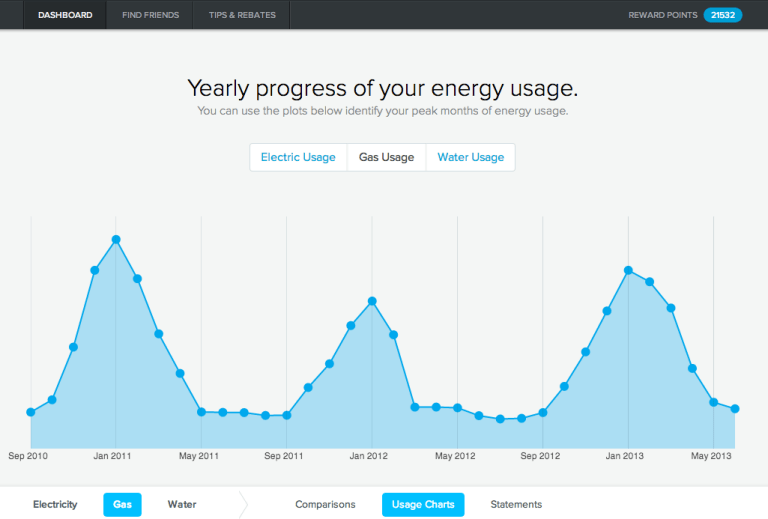 Track and compare your electric, gas, and water usage with friends and neighbors. I’ve been using a great service to track our family’s energy use over the past few years, myenergy.com . The service recently got a makeover and is now a Nest Company. Nest makes those high-tech energy saver thermostats. As you can see, The Frug is not so frugal when it comes to energy usage. 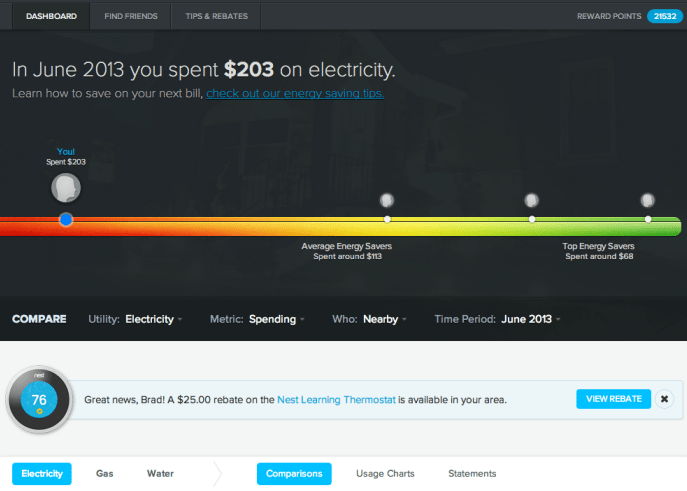 Looks like our family of four is spending double what the average energy user in the area is spending. You can track by total bill, or in the case of electricity, actual kilowatt hours. You can also track and compare with your neighbors or with friends anywhere in the country. Either way, we are off the chart. I still get quite a few complaints that the house is not cool enough. The source of the complaints is a two level heating and cooling system linked to timed zone thermostats downstairs and upstairs. I have them set up to cut off the air conditioning downstairs when no one is around and vice versa, upstairs. I need to reprogram them every time daylight savings rolls around and even need to get the system rebalanced occasionally! All of this to spend more money than my neighbors! I think many people including myself focus on the heating and air-conditioning, but don’t realize how much energy appliances and electronics consume. A few years ago I read that cable boxes use more energy than an average size refrigerator even when the TV is off. We’ve gotten rid of all of our cable boxes, soon to be followed by the cable company. More on that later. I’d be interested to hear what other folks spend on their electric or gas bills. I must say that we’ve done much better on the gas/heating bill over the past few years. I’m going to be sharing other family of four stats on this blog. A lot of the economic reports include great detail on family of four spending. I will be trying to get to the bottom of why our family of four spending often bears no resemblance to the stats. For example, I am continually blown away by the amount of water we use for a family that doesn’t water the lawn or have a pool. Is our water meter rigged? Do our toilets run all night? (They don’t. I did the food dye test) There are also the families that spend way below the averages, this is where we want to be. Mr. Money Mustache publishes his family’s entire budget. He was recently featured in the Washington Post. People around here have really had a hard time getting their heads around how he pulls this off. It’s good reading. Example of some of the charts on myenergy.com. As an added incentive the service is free and you also get points for lowering your energy bill. The house is hot. Frugality be damned, I am off to crank the a/c! A hot house makes me stabby. Here is my way to be frugal….I like to be cold to comfortable. Baby, when it is hot outside, or there is too much pollen….I am comfortable inside. When it is freezing outside…I keep it cold inside and throw on extra layers. I have no idea as to wether this balancing act works out or not, but that is how I justify my energy use. Great to hear from you. I like it cold as well. There’s new research that it’s even good for you. Athletes that are working out in cold weather burn significantly more calories due to their bodies trying to maintain temperature. That’s how Michael Phelps burned 12,000 cal a day in the pool.